I want to share a history lesson. The Constitution of the Unites States is the supreme law of the land. It establishes many foundational elements including the branches of government, the roles of the federal government vs. state governments, and a set of individual rights including the first ten amendments, which are called the Bill of Rights. It’s an amazing document that is perfectly relevant today, which is remarkable since it was fully ratified in 1789. If you haven’t read the Constitution, I highly recommend it. At Berlin Packaging, we have our own form of a constitution. 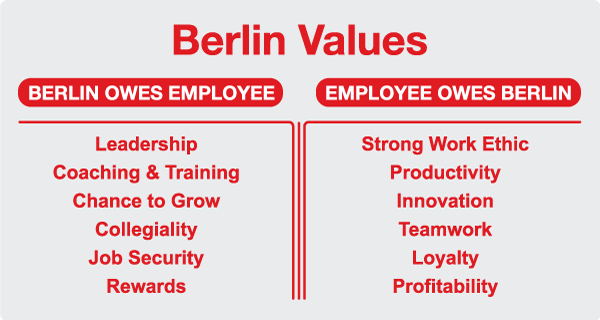 Our Berlin Values T-Chart lays out the desired behavior of two constituents. The first is what the company owes the employee, and the second is what the employee owes the company. In a clear way, the T-Chart explains the mutual obligations the company has with its employees. I see these six things as fundamental goals of an excellent employer. To create employee engagement and thrill, these six items are key. In fact, if you think about why you left a prior employer, I’ll bet it was due to a failure in one of these six items. Again, these are foundational issues and we want to have a team that delights in providing them in exchange for the other side of the T-Chart. Second, I like how flexible the T-Chart is. We haven’t rigidly defined each of these words. This allows the T-Chart to morph itself to apply to so many people and situations. It’s impossible to contemplate all the scenarios and individual situations that may arise, and how different people bring different needs and strengths. So it’s great that the T-Chart doesn’t prescribe narrow lanes. Third, I like how the T-Chart has stood the test of time. Since we launched the T-Chart over 20 years ago, it has stood with us. But just like the US Constitution, which has seen many amendments over the years, the T-Chart can be amended and enhanced. Ultimately, the T-Chart is the backbone of how our company operates.